I was having some problems with my brakes. Turned out one rear brake was leaking oil and covered the shoes in oil. Got the seal fixed, new shoes for the drum brakes and put it all together. Bled all 4 brakes and kept ToppiNg up brake fluid. Now while the car is idle and you press the brakes, the brake light on the dashboard comes on (same light as handbrake light) never came on before for "regular" brakes. When driving it hardly comes on but when idle and pushing the brake it will come up. Don't have an owner manual and my mechanic can't find a brake fluid was or/switch anywhere. Opened up dashboard, around steer, under the car, nothing. We've bled all 4 brakes at least 4 times by now. Brake light on dashboard still comes on. Anyone any idea why the light now comes on and where the sensor/switch is? The mechanic thinks it's a pressure issue . He is considering replacing the cylinder but he's not sure it will fix the problem. there doesn't appear to be any other switch. 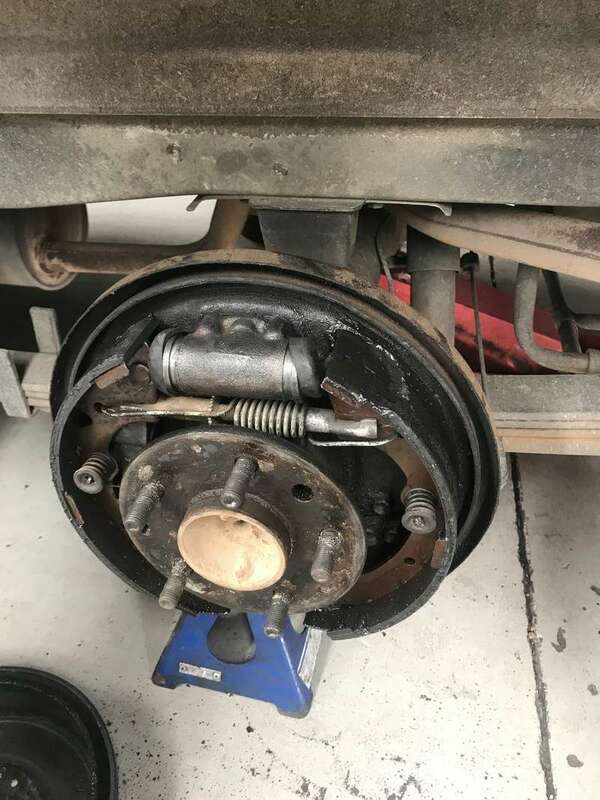 Also bear in mind there is a restrictor to the rear brakes that detects the loading of the van by the level of the rear suspension. It stops rear tyre skidding of lightly loaded vans. That may stop you bleeding them properly, but I guess you can see if there's fluid being pumped out for the bleeding op. Do you know where I can find the switch for the fluid level? I think that's the problem. And do you think it's something that can be correct by changing the master cylinder? So we changed a seal in the drum and changed the shoe. Maybe something went wrong there or is that unlikely? I've added a few pictures. Before, the seal we replaced and after. Hi, to me it sounds like a vacuum issue. Because you only have the issue while idling. When driving you do more revs and more vacuum power, hence no issue. The difference between driving and idling is not relevant to the hydraulic system that you already bled and filled. Try pressing the brakes lightly until the light comes on. Keep it that way with the light on and rev the engine to see the light go away. IIRC those 'seals' are just dust seals, they have no purpose to stop brake fluid. So either that fluid is oil coming from the diff or if it's brake fluid you need a new wheel cylinder. Brake fluid dissolves in water so take a dab of the fluid from the old pads and see it forms an oil film or dissolves. None of that would explain the light however, especially if the reservoir is rear the correct level - which can be visually seen. You can see any wires and all the brake pipes at the back so check along each one to see if there is a pressure balance sensor but there isn't on mine (trailing arm van). I've just tried that but they don't seem connected. The light doesn't stay on for a long time when pressing the brake so I also tried review when stationary and then pumping the brakes several times. The light still come on. However when reved up to 3000 it seems to come on less often/stays on shorter. My mechanic mentioned when driving the light only comes on if you press the brakes a few times quickly after each other. So on first brake - no light. Press brakes again straight after and it does come on. They've told me it was oil. Mixed with dirt. Coming from the diff. It's only on the left side. 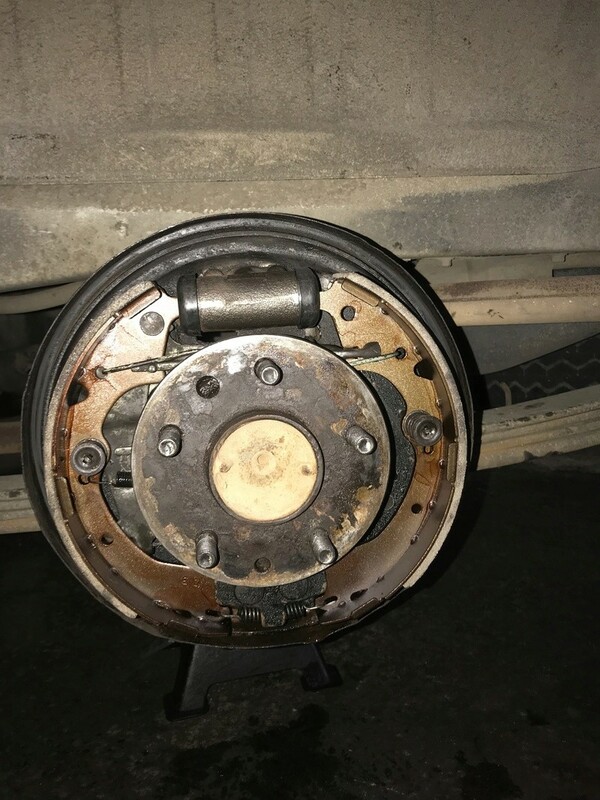 Right side drum brake is fine. Should we have replaced something else then that seal? We have had the van up on a hoist and gone under and checked for a sensor. No luck. The dashboard brake light has only come on previously when engaging hand brake. Yeah we've kept topping up the brake fluid while bleeding it so it wouldn't run low. It's at the correct level now. I still think it is the lacking of vacuum power. It wouldnt be to hard to add a vacuum meter in the line. I dont know at which level the sensor turns on the light. Ok. Do you happen to know where the sensor is located? A friend mentioned there might be air in the master cylinder that's hard to get out. Or could it be worth replacing the master cylinder all together? I agree with 4wd: sounds like a low vacuum. Check your vacuum hoses are not cracked and leaking. 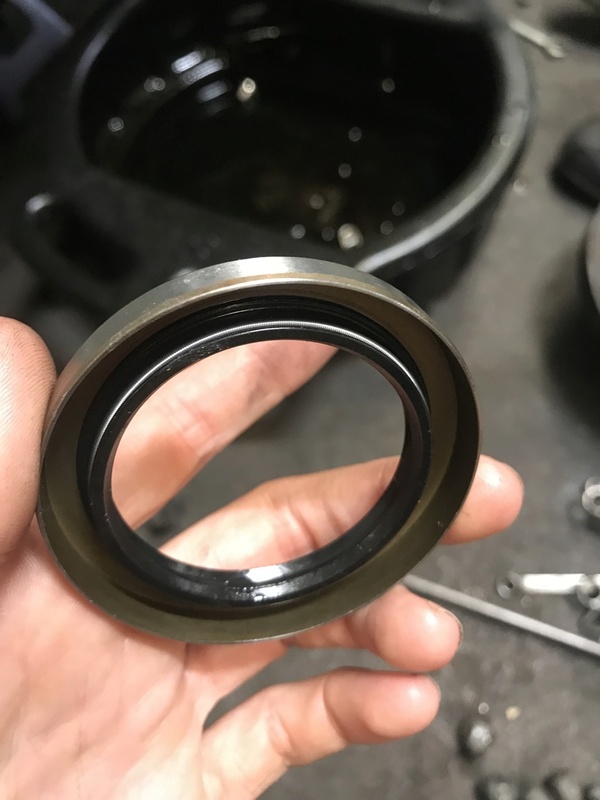 If it's oil you have a worn oil seal on that side which may be just a seal or also a worn bearing, see how you go, if the oil comes back you'll need to get it fixed. I'd probably plan to have it fixed anyway at some stage. Not sure what's involved to change just the oil seal. Maybe worth changing the diff oil before you get too much done unless there is detectable play. Ok I'll ask him to check the vacuum today. So since it's oil we changed the seal and the shoes already. It's just that the light didn't come on before we changed the seal. Not sure about the bearing, I'll ask. But he said the bit on the axel was still in good condition. For my Hiace I see the vacuum sensor and the level sensor both present somewhere under the dash (it is a vague diagram). It will probably be the same fpr yours. If you find the sensors you can unplug them and measure which one is triggering. With a multimeter. Maybe you fix the issue with replacing the master but maybe you don't. That has been the bugger. We've taken the dash off twice to find it but so far it proves to be elusive. What year is your Hiace from? Mine is 1988. So since it's oil we changed the seal and the shoes already. Ah - sorry, I was confused by the pictures and the description. I thought you had only replaced the wheel cylinder dust seals as they were off on the top pic, back on the lower picture and you said 'we changed a seal in the drum': I hadn't realized you'd changed the axle bearing oil seal! Haha no worries. I just took a few snaps before to keep track how it was meant to be put together. And after to celebrate my fine new brakes. Or so I thought. Since it leaked diff oil before. Could that be at a low level and causing the brake light to come on somehow? A 1988 LH61 has a vacuum sensor. Under dash but unclear. Might as well be behind front bumper? A brake level sensor doesnt come up so clear so maybe it doesnt have one. That would mean a vacuum issue. How is it braking when braking repeatedly? Do you have to work harder on the pedal? I've just taken it for a drive around the block. So I pressed the pedal several times in a row whilst driving in 2nd gear. First two pushes normal. After that the pedal becomes harder and harder, brake light comes on. And once the pedal starts getting hard it barely brakes anymore. This entirely sounds like you running out of vacuum assist. How bad is that/how is that fixed? Sorry this is my first car ever so it has all been a bit of a crash course so far. Up to yesterday I didn't even know there was such a thing as drum brakes. You need to find and follow the vacuum pipes from the vacuum pump to the brake servo, and see what condition they are in. That's what I'd do anyway . You may even hear a hissing sound if there's a bad leak - but your mileage may vary. Usually at this age the hoses start to perish or the bits they plug into start to rust. Thanks so much. My mechanic is going to give me a call today to come back in the afternoon to try and sort it out. So I'll mention this. We spent about 7 hours on it yesterday. He hadn't worked on one of these for 20 years. Fingers crossed! We're going to replace the seal of the master cylinder now and see if that does the trick. Part is meant to come in today so fingers crossed.